Founded in 1933, Lighthouse for the Blind (LHB)’s mission is to “assist individuals who are legally blind maintain dignity and independence by making available employment, education and support services.” The nonprofit employs 48 people who are legally blind in their two St. Louis County assembly and packaging plants. The sales revenues from these products support LHB’s community outreach programs. This is the organization’s third acquisition of for-profit, privately-held businesses. In 2015, LHB acquired Tear Mender with The DVS Group’s advisory services. The organization’s acquisitions have allowed them to provide a triple synergy through increasing their endowment return, increasing job opportunities for their community and increasing funding for their education and support services. RapidFix represents a line of dual-component adhesive products. Designed to create an instant bond versus other slower curing epoxy products, RapidFix products are used to reinforce repairs similar to a weld, while also filling holes, gaps, and cracks in a variety of materials. 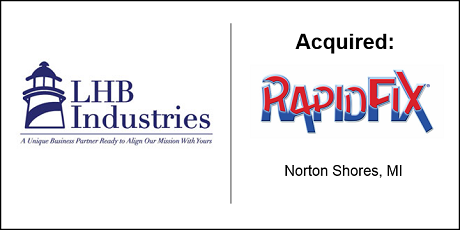 RapidFix products were acquired from Boss Products USA, LLC. Len Kelsey is president of Boss Products. An Australian transplant, Len built his company in the U.S. in the early 1990s. In 2008, he developed RapidFix products and began selling them across the country and, eventually, across the world. After following The DVS Group’s proprietary deal sourcing process and vetting potential targets, LHB zoned in on RapidFix as their ideal target for this acquisition search. The RapidFix products fit LHB’s current operations but also allowed the organization to expand to new markets. Few nonprofits currently pursue acquisitions of for-profit, privately-held businesses. The DVS Group is proud to lead the way into a new field of incorporating social impact into investment banking.